Question 1. This article is based on your earlier dissertation work. We noticed that you presented this paper in conferences as early as in 2004, almost ten years before it is finally in print! Could you walk us through the journey of how the research idea developed and evolved along the way? What are some of the challenges you faced and overcame in the process? The paper started as the early seeds of my dissertation on foreign direct investment and institutional environment relatedness. The best advice that I received as a PhD student from one of my advisors at NYU-Stern was to try and write my dissertation draft immediately after I finish the comprehensive exams. Why? Because at that rare moment in your career, you have a mental memory of the entire field of all literatures and they are up to date. From that perspective, you can clearly see the broader discussions across literatures. As a result, you can more easily identify what is missing from the big picture. Observations from this point of view position you to make bigger contributions to the field when you can observe and articulate what is missing. (It’s a very different approach than the incremental paper design). Back in 2004, I could clearly see that the literature on multinational corporations (henceforth, MNC) learning theorized about the internationalization process, but did not have a well-defined process to measure whether learning was occurring. Nor was there a tractable method to capture the learning differences across countries. This advice I received early in my PhD journey presented me with a challenge. But my advisor was right. I now pass along this advice to several PhD students who are in the early stages of thinking about which questions they will tackle in their dissertation. Seize that moment. It works! I did present this research paper at several business schools and conferences before I submitted the paper to Administrative Science Quarterly. I am grateful for those opportunities to gain feedback on which theoretical angle and framing was most well received by differing perspectives across departments and conference interest groups. I learned that the key distinction between a dissertation and a published paper is finding the right audience in the journals. 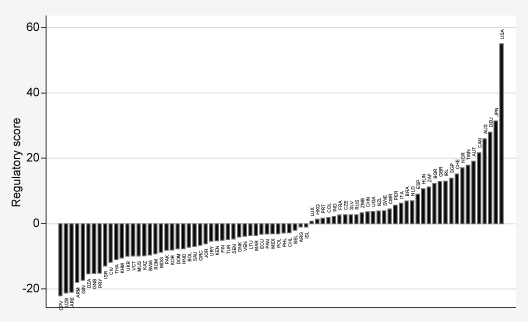 Your publication pipeline can potentially move along faster if you can reconcile the two paths during your doctoral student years. The biggest challenge that I had to overcome in the ASQ review process was data collection. Studying the strategies of MNCs, you will invariably have to collect your own data. With some trips to Brazil to collect my dissertation data, I was very attuned to the time and cost associated with collecting reliable data on internationalization. During the ASQ review process, this challenge persisted. At each round of revisions, I had to collect new data across the 80 countries where I was examining a firm’s prior institutional experiences. This was necessary to sufficiently tease out other aspects of learning and rule out alternate explanations. Question 2. Although your paper highlights the importance of the similarity of prior regulatory experiences for an organization’s foreign investment, you have also noted from your field studies that many field managers are often blindsided by institutional differences. From your interviews, can you get a sense of whether capabilities via these similar prior experiences are specific to managers or do they accumulate via certain organizational-level processes? The managers that I interviewed suggested that both were issues, meaning the managers’ own experiences and how they shared and coded knowledge across subsidiaries. The firm executives I interviewed who seemed more effective in using prior institutional knowledge were those who had regular management meetings across global subsidiaries to share best practices. There was great variance among the executives whom I interviewed as to whether they were communicating with their peer foreign investment managers in other countries. This appeared to be an important success factor. Question 3. One of the interesting findings in your study is that it is relatively more difficult for an organization to adapt from a highly regulated environment to a much less regulated one. What are your thoughts about the possible explanation behind this result? For instance, does this suggest that organizations from a weaker regulatory environment could develop some form of generic institutional capability, which organizations from a stronger regulatory environment lack? 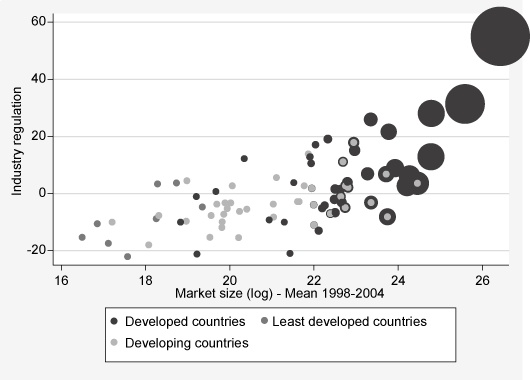 The amount of regulation between developed economies versus developing countries varies greatly. This figure provides a great visual impact of the regulatory institutional gaps that firms investing from developed economies have to fill or learn to navigate through. The implications may suggest that firms from institutional environments with weak regulations are more skilled at filling institutional voids and/or have a stronger ability to shape and control regulations in the market place. One example is the low levels of political competition for regulation in Mexico. Because there are no term limits on the telecommunications industry regulator’s position , the power the regulator has to determine which players do and do not gain access to the market is enormous, compared to the U.S. telecommunications regulatory roles. Here the five commissioners operate as a consensus team and each have one term limit of five years. These vast differences in regulating markets in developed versus developing economies give firms that compete more experience in navigating the institutional weaknesses. In Brazil, this capability is often call Jeitinho Brasileiro. Question 4. You found support that both breadth and depth of prior experience are important for the success of a foreign investment, and interestingly, the depth of prior experiences seem to matter much more than the breadth of experience. To what extent do you also see a trade-off exists between the two types of experiences in the context of foreign investments? While breadth and depth of knowledge both certainly matter, the tradeoffs are worth noting. Depth of knowledge allows a firm to develop more locally relevant nonmarket strategies to navigate the regulatory environment. This also perhaps gives the firm a competitive advantage among their peer firms that have not acquired as much depth because they have not invested and left as many imprints around the world. Breath of knowledge, on the other hand, allows firms to have a broader span of knowledge types — though oftentimes surface—that might be applicable in many more countries. Thus entry may be more easily achieved by firms with a greater breadth of knowledge. The tradeoffs are certainly worth further exploration in subsequent research. Question 5. While your study highlights the importance of having similar institutional experiences in FDI, do you think these similar experiences could be a disadvantage? For instance, MNCs could be constrained by their prior experiences and choose to invest in foreign locations where the regulatory environment is similar to that of their home country, rather than seeking out potentially better opportunities in less similar environments? Having similar experiences allows MNCs to leverage prior learning the most, both in terms of understanding the regulatory environment and creating economies of scale and scope across countries. The latter is important in industries such as telecommunications or other high tech industries where there are international standards (e.g., WTO Basic Telecom Agreement, DVD, etc.) and network effects. However, new learning opportunities over time will require firms to take calculated risks on learning environments that require a new skill set. From this perspective MNCs can trench a path that leverages both their prior experience but also new knowledge acquired on some learning dimensions. This important step requires firms to conduct a deeper level assessment of the different dimensions on knowledge acquired to understand the similarities among the more newly acquired knowledge sets. Recency of knowledge is another dimension of learning that is underexplored in the internationalization process that future scholars may want to consider. These timing factors are often ignored.